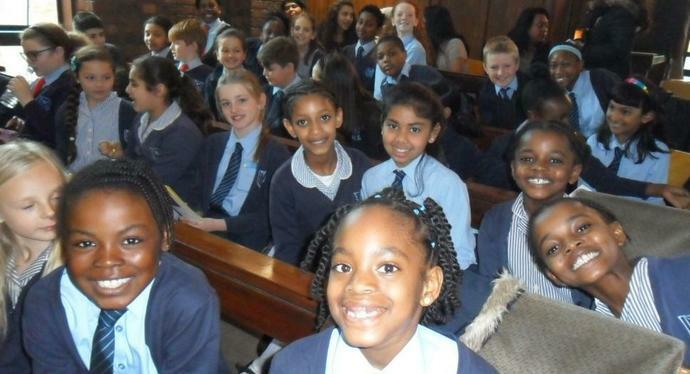 JUNE 2017 AND WE ARE WORKING ON SONGS FOR THE BRENT PRIMARY SCHOOLS' CHOIR OF THE YEAR COMPETITION AND THE PARISH CONCERT. HERE PLEASE NOTE THERE HAS BEEN A CHANGE OF TIME AND VENUE FOR THE CHOIR COMPETITION. Further details will be sent out nearer the time. 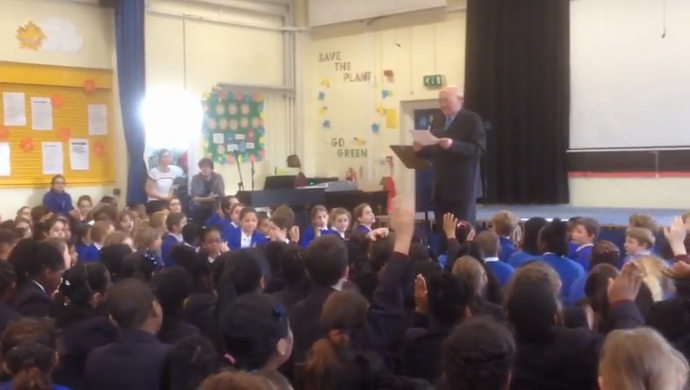 Earlier this year we went to the first round of the competition at Princess Frederica School and along with a number of other Brent schools, we sang for the Head of Brent Music Service, who judging our performances. It was a great morning and the standard of the singing from all the choirs was brilliant, and we kept our fingers crossed that all our hard work had paid off. Two years ago, we received a gold award so hoped for the same, or better. We were not disappointed as we were awarded a PLATINUM certificate. You can see our reaction in the film below, along with our singing performance. We had to wait a couple of weeks to find out which choirs were in the final, as out of about 28 choirs, only 6 could be finalists. We are delighted to announce that WE ARE IN THE FINAL!! We had a very busy Autumn term, mainly rehearsing for the Young Voices concert in January 2017. We also sang 2 songs on the school's Christmas cd. On Friday 2nd of December we sang carols at Kensington Palace and met Queen Victoria. She was very impressed with our beautiful singing and commented on how well we kept in tune. On Tuesday 17th of June we took part with thousands of other school children in the Young Voices concert. We had been learning a lot of different songs and really enjoyed singing them in such a large group and at such a huge venue. Parish Concert Friday 1st July at 7.30 at St Mary Magdalen's Church. Brent Makes Music Wednesday 6th July at Wembley Arena at 7.00. As you may have heard we had a great day at the Civic Centre in 2015, the childen sang brilliantly!! The standard of the other choirs was very high, and although we didn't win the top prize, we came away with a Gold award and some extremely positive comments from the judges. Well done to our wonderful singers!! We are entering the competition again this and hope to get a platinum award! In 2016 we were part of the Brent Music Service concert, Brent Makes Music, with other school choirs and musicians. This was at the Wembley Arena and was a great experience for us to see and hear a real variety of music and performers. “I think the choir sounded absolutely beautiful. They make a lovely sound and you can clearly hear confident two part singing there. IF YOU WANT TO HEAR WHAT WE SOUND LIKE - CLICK HERE! Another enthusiastic and well recieved performance. The children sang beautifully at the Mass, especially the Lord is my Shepherd at Communion. Fr Kevin was very complimentary with his comments in the school newsletter. 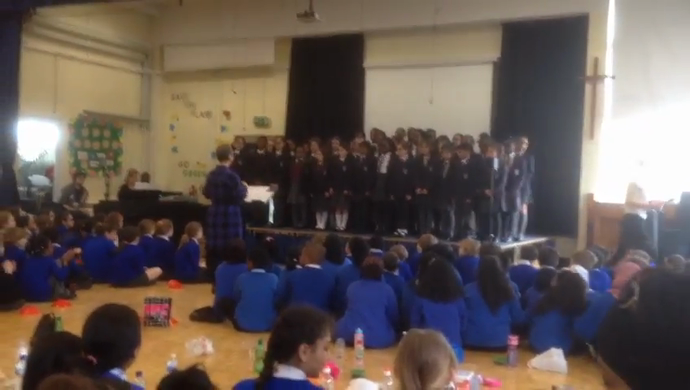 The choir joined thousands of other children in the Young Voices Concert on 27th January 2015. It was loud, exhausting but an amazing experience. SOME COMMENTS ABOUT THE CONCERT!! It was a life changing experience. I was really excited to sing and watch the other schools and famous people sing and dance with us. - I enjoyed singing there. It made me feel special to be one of the 7658 children who performed there. It made me feel important to know that there were famous people and lots of parents in the audience and we were singing for them. My favourite part of the experience was singing and meeting all of the famous people, like Lucy Spraggan from X Factor, Mike Lowry and Urban Strides. It made me feel special to be part of such a big event. I really liked the Young Voices Band. It felt weird to be out that late with my friends. The lights were really bright. I felt very special performing in front of a huge audience and it felt magical. My favourite part was when all of the lights turned off and all you could see was the Young Voices lights. I am really grateful to Mrs Grynert because of how much effort she has put into preparing the trip and working with us in choir. I am proud of her for being a part of the teachers' choir. They were brilliant!! With many a twist and a shout! A good day, full of song, full of dance and our Young voices choir!